One of our holiday traditions is to make homemade cookies for Santa and the reindeer. We were getting ourselves pumped for the holidays when my son asked, "What if Santa has Celiac?" Good point! Last year I was diagnosed with Celiac Disease. I've been amazed at how many people I've encountered with the same or similar affliction. If you hang out in the gluten-free section of the supermarket you'll make lots of friends. Everyone's eager to share in this community and it's one of the nicer aspects of the disease. Another interesting development from the diagnosis is that my kids have become fascinated with what ingredients are in food, how the digestive system works and what it takes to make choices in your life when you are your only enforcer. I got in touch with our friends at Sans Bakery for a good, gluten-free cookie recipe. 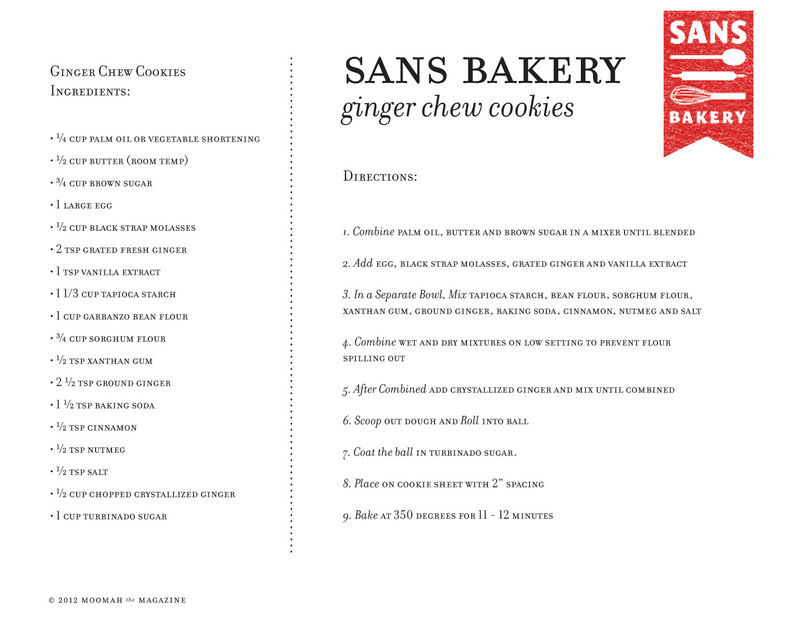 We love these delicious Ginger Chew Cookies and adore the girls at Sans Bakery. This recipe yields the chewiest, sweetest, most delicious cookies that even the discerning palate of Celiac Santa won't be able to tell they are sans-wheat! Another one of our holiday traditions is leaving a note for Santa when he comes to visit and he, in turn, leaves one for the kids. We usually leave a huge piece of craft paper out for him to write his note back. Santa is always effusive in his praise of all the kids have accomplished in the last year. I keep all the notes in a secret place and look forward to showing these to the kids when they are older and the magic of Santa is no more. This year, we're leaving a note with a little more staying power. We discovered a trick using Sharpie pens and dinner plates. We've written our notes directly on the cookie plate that we intend to leave out overnight, so that Santa will know that the cookies are gluten-free and safe for him to eat. After he eats all of his cookies, Santa will write his note to the kids on a matching plate, before flying off to the the next house. My evil plan is that someday I'll have a collection of plates, showing our correspondence with Santa over the years, and they will be used to serve our Christmas dinners. P.S. We do not use expensive plates for this activity! WRITE your message on the plate with a Sharpie. Don't be afraid to use colored Sharpies to really get your message across! BAKE your plate in the oven for 30 minutes at 150 degrees. This piece originally appeared in Moomah The Magazine. Follow Moomah on Twitter: (@MoomahMagazine), Facebook and Pinterest.